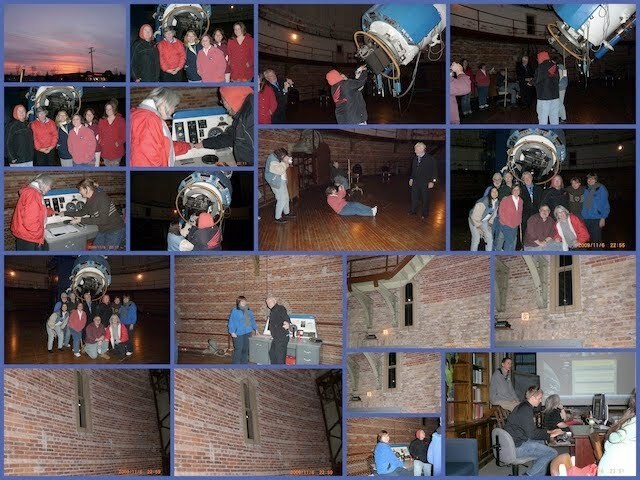 Teachers and researchers got certified to borrow moon rocks, experimented with model rockets, and operated robotic telescopes at Yerkes Observatory on Saturday, November 7, 2009, as part of the Observatory's Teacher Lunacy Weekend. The event was sponsored by the Yerkes Observatory, a facility of the Department of Astronomy and Astrophysics of the University of Chicago. Yerkes is located in Lake Geneva, Wisconsin. The NASA representative also gave teachers a tour of the NASA website, showing teachers how to search the large body of educational materials that NASA produces. Teachers built and launched paper rockets powered by compressed air in the afternoon session of the all-day event. They measured the rockets' trajectories and discussed which rocket designs performed best. In another experiment, teachers threw stones at piles of loose material to simulate the ejection of debris from a lunar meteor impact. Professor Dan Reichart and graduate student Josh Haislip, astronomers from UNC Chapel Hill, demonstrated their remote-controlled, robotic telescopes located atop the Chilean Andes. The array of six telescopes, dubbed Panchromatic Robotic Optical Monitoring and Polarimetry Telescopes or PROMPT, can be operated with a web browser from anywhere in the world. The telescopes are part of a system called SKYNET, a growing worldwide network of robotic telescopes. SKYNET members have access to all of the network's telescopes. After logging in to the SKYNET website, members can schedule an observation, which will be performed automatically by an a robotic telescope at the scheduled time. The member will then have access to the images the telescope created.